TRAINING YOUR DOG TO WEAR A MUZZLE. There can be many reasons why you might want to muzzle your dog and we will not go into this here. We will assume that for whatever reason you or a canine professional have decided your dog needs to wear a muzzle. There is a proper way to go about it to ensure you do not have a lifelong battle every time you want to put it on and you and more importantly the dog doesn’t get anxious and stressed leading to further behaviour problems. Do not expect your dog just to accept a muzzle being put straight on. All the following advice is assuming your dog has never worn a muzzle before. PLEASE READ THE WHOLE TOPIC BEFORE STARTING ANY TRAINING. Like most new things that you want to introduce your dog too it needs to be a gradual affair. You need to build up a good association to the muzzle for your dog before you even think about putting it on them, imagine how you would react if someone you trusted held you still against your will and tried to force a muzzle on you let alone a dog that has no comprehension about why it is being done. The dog may well already be anxious, stressed and worried by the reason for wanting to use a muzzle in the first place so you want to get it right. Firstly let's take a look at the type of muzzle to be used. 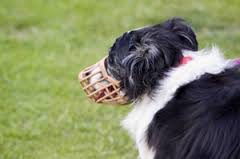 I would always recommend using a muzzle of the Baskerville (basket) type as above, one that allows easy opening of the mouth within the muzzle that doesn’t restrict breathing or panting and allows the dog to drink water and if required take a treat. Dogs can only regulate their temperature through panting and to a much lesser extent sweat through their feet (negligible really) so do not use the tight material types that do not allow it, especially on hotter days. Make sure you get a muzzle that fits properly, be prepared to have to change your muzzle for a different size to ensure a good fit, we won't be fitting the muzzle though until near the end of the training. If you want to you could use some snips to cut out a small part of the muzzle to allow a slightly bigger hole for giving treats through, ensure there are no rough/sharp ends if you do. Dogs learn a lot of behaviour through association so to start we want to build up the association that the muzzle means good things by pairing it with something good, something very good. The treat you use for this wants to be one of a very high salience to your dog, preferably something that will not crumble and have them licking the floor and ignoring you to find more. Take the time to find the treat for your dog that will do the job, it does not have to be very big just good, I have used small pieces of cooked liver, small cubes of chicken etc, these sort of treats are better than processed doggy treats from the shop full of colours and additives, find something that works well for your dog. If possible only use the treats you decide on for this and nothing else until they are habituated (used too) to the muzzle. At home (preferably) or in an environment with no other distractions about we need to present the muzzle with one hand and then give a treat immediately after with the other, if your dog does a good sit you can ask for one first to sharpen his attention. Present the muzzle then treat then put the muzzle behind you or to the side as long as it is out of eyesight, you can add a "good boy" or similar with a jolly tone instead of a treat (sometimes), some quick learning dogs may try to seek out the muzzle after only a few goes to get a treat. Do this several times quite quickly to build up the association that appearance of muzzle means something good, after five or six goes have some time off (can be 5mins or 50mins) then do another session of five or six presentations. As well as giving a treat after presenting the muzzle you could play with a favourite ball or toy, present the muzzle then immediately start play, throughout this training we are trying to achieve the association that the muzzle brings good things, have a jolly manner about yourself throughout so no negative associations are made. Between periods of presenting the muzzle put it away and return to your normal activities and be normal. If all is going well you can now try giving the treat through the muzzle, don’t ask them to put their head right into it to start (unless it appears not to be a problem), poke the treat part way through and let the dog come to you with it's head (do not force the muzzle onto it's face). Present five or six times every fifteen minutes or so as before. All the preceding can be carried out over a few days or if the dog is willing and obviously unworried you can do it all in the same day or even with some intelligent and unworried dogs in one long session, personally I would take the time with any dog. Hopefully now your dog will happily put their head into the muzzle to take a treat, you could stop here for now and restart later or the next day, if things are going well and your dog is very interested and not at all worried you could carry on with the next step. If you have decided to leave the training and return to it later or the next day you need to quickly build up the good association again before carrying on to the next step. So, now we are at the stage where your dog happily puts it's head into the muzzle. The next step would be to clip the muzzle up behind the dogs neck but have it hanging loosely below the dogs chin (not on). Give treats, praise or play for short times taking off and putting the muzzle back on again (remember don't fit yet but have hanging), if your dog becomes worried or distressed take it of and try again a bit later, we do not want any negative associations to the muzzle. Now your dog should be excited by the appearance of the muzzle as it thinks something good is coming, he/she should be happy to run around with the muzzle clipped up behind the neck but hanging below its chin. The next step is to build up the good association again and then go for your dog willingly taking treats from out of the muzzle while keeping it's head in it, increase this time by not giving the treat too quickly (not too long either though). If all is going well you can now clip the muzzle up properly while your dog has his/her nose in it, have a jolly manner about you and do not become angry or aggressive. Only leave the muzzle on for short time to start, give treats and praise/play all the time. Repeat this a few times and leave it for a while if your dog seems to be anxious or worried. At any time when you return to training build up the good association again before continuing. Hopefully your dog will now look forward to interaction with the muzzle and wearing it. Make a point of putting on the muzzle at different times so your dog does not learn that the muzzle precedes a certain behaviour, environment or context. Do use the baskerville (basket) type muzzle, they allow panting and taking of water/treats through them. Your dog will suffer in hot weather if you use restrictive types that don't allow panting (the only real way they can cool down). Do not become angry/ aggressive while carrying the training out. Do not force things at any time. Go at your dogs pace, all will be different. If your dog seems worried/anxious postpone until later. Always build up a good association to the muzzle before further training. Use treats, toys, praise that are good enough for the job, much will be needed early on in training but once the objective is achieved you can reduce the frequency but still treat/play regularly when putting on and using the muzzle. Make sure the muzzle fits well, getting one that is too big “for more room” will rub and they may come off. Make a point of using the muzzle at different times/situations so the dog does not learn muzzle precedes a certain situation/environment. Do not be afraid to use a muzzle if required, do not worry about what other people might think, be a responsible owner, be happy. You can employ all of the above practices for introducing other canine aids like a harness or halti to your dog. To get yourself a baskerville muzzle follow the link below to Amazon, remember to look at the size guide to get the right size for your dog. If you have a dog that pulls on the lead try a non pull harness, or a halti, introduce them like the muzzle, build up a good association to them with good treats before trying them on, take it in stages, over a couple of days if necessary. The harness and halti will not work with all dogs but will with most, depends on your dogs amount of drive and the owners input, get some professional help if you need it.